Prevention of labor trafficking will be the focal point of this year’s observation of the EU Anti-Trafficking Day. The Ministry of Labor and Social Policy has conducted joint operations with the Ministry of the Interior, during which they have discovered potential victims of human trafficking with the purpose to be forced to work, said Elena Grozdanova, member of the National Commission for Fight against Human Trafficking and official of the Ministry of Labor and Social Policy. She fell short of giving an exact number of trafficked victims. In Macedonia at the moment, she said, over 100 labor inspectors are active after being trained to recognize victims of labor trafficking as part of a project of the Council of Europe. 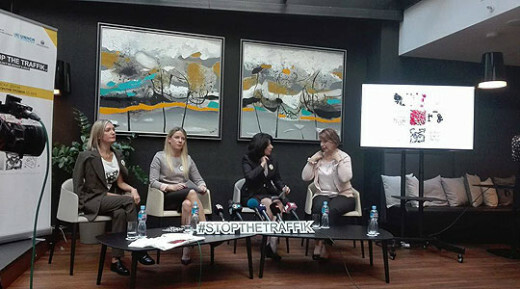 Grozdanova was joined Wednesday at a news conference by Magdalena Nestorovska, national coordinator for the fight against human trafficking, and Marija Ilic of Fashion Weekend Skopje, to announce the activities planned on the occasion of EU Anti-Trafficking Day. “October 18 is just one day when we are trying to raise public awareness about human trafficking,” Nestorovska said adding this year an emphasis would be put on labor trafficking, a growing phenomenon at global level. “It allows criminals by human trafficking and by abusing one of the fundamental human rights, right to work, to make huge profits,” she stated adding measures should be strengthened not only to find the perpetrators, but also to protect the victims, usually women and underage girls. Most labor trafficking victims in Macedonia are girls. Furthermore, the Skopje Fashion Weekend on Oct. 22-25 will launch a campaign to prevent human trafficking. “It’s important for us to know that no one has been exploited in the chain of textile industry and that the clothes we are wearing are made in fair working conditions,” Ilic noted.